from 8:00 a.m. to 4:00 p.m.
GIVE ALOHA. Support our organization to fundraise even faster! Make a donation to the Friends of Hawai‘i Volcanoes National Park (organization code #78625) at any Foodland, Sack N Save or Foodland Farms -- and Foodland and the Western Union Foundation will make a donation to our organization, too. Just show your Maikai‘i Card and make a donation to our organization (up to $249 per person) at any Foodland, Sack N Save or Foodland Farms checkout from September 1 – 30, 2011. Thank you for your support! For more info, call 985-7373 or email admin@fhvnp.org. Saturday, September 10, 2011 at 11:00 a.m. ANNUAL MEETING. Friends members get a rare behind-the-scenes experience in the Volcano House, which has been closed to the general public for renovations since 2009. See the gutted lobby and other public areas, new roof and exterior paint job, and seismic and fire safety improvements. 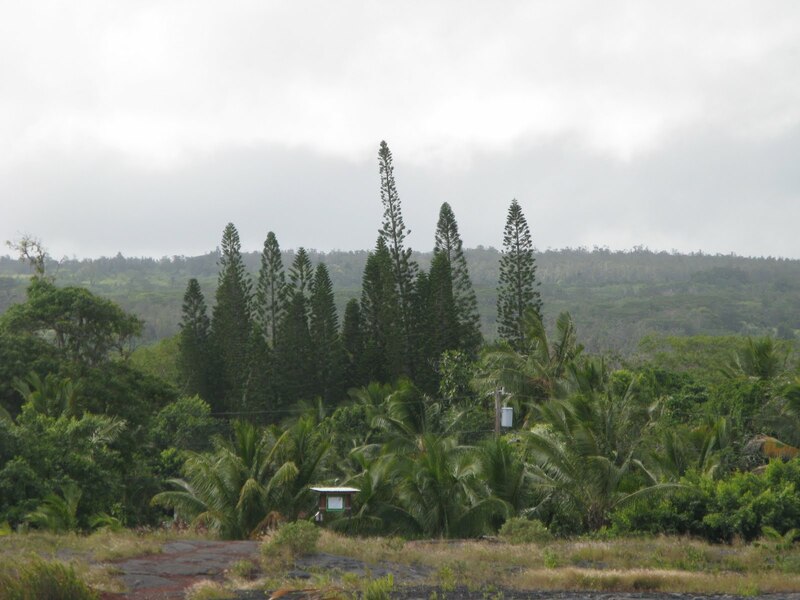 The meeting takes place in the koa bar, with a panoramic view of Kilauea Caldera and the vent at Halema‘uma‘u Crater. Join us for an exciting day of meet and greet, the board of directors election, and a light luncheon. Our keynote speaker is Dr. Don Swanson, a senior geologist with the U.S. Geological Survey’s Hawaiian Volcano Observatory, who summarizes the current state of activity at the summit and along the east rift zone. 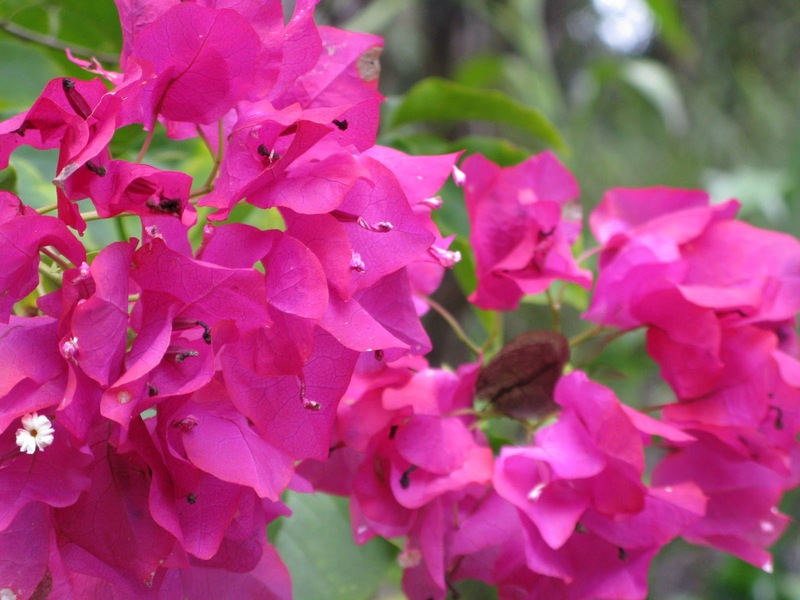 After lunch, choose between three special guided tours of the Volcano House, the ‘Iliahi (Sandalwood) Trail, or Hawai‘i Volcanoes National Park’s native plant nursery. Non-members are welcome to join the Friends in order to attend. Park entrance fees apply. Please RSVP by Monday, September 5 by calling 985-7373 or emailing admin@fhvnp.org. For more info, visit www.fhvnp.org. Sunday, September 11, 2011 from 8:30 a.m. to 4:30 p.m.
SUNDAY WALK IN THE PARK. This monthly program on second Sundays is aimed at bringing together the members of the Friends to share in Hawai‘i Volcanoes National Park’s beautiful trails. Led Nick Shema, this month’s 8-hour, 14-mile round trip hike will explore the Napau Trail. Since this is not intended as an interpretive hike, we will move along at a steady clip. Following the East Rift Zone of Kilauea, the Napau Trail provides opportunities for hikers to experience a diversity of environments ranging from recent lava flows to dense tree fern rain forests. The destination is Napau Crater where hikers may gaze from the rim at Pu‘u ‘O‘o vent steaming and fuming in the distance. This 14-mile hike, which includes a 620’ elevation gain, is rated strenuous and hikers should be physically fit and free of respiratory and heart ailments. Bring a bag lunch plus at least 3 quarts of water and meet at the Mauna Ulu parking lot. The walk is free to Friends members (though non-members are welcome to join the non-profit Friends group in order to attend). Park entrance fees apply. To register, call (808) 985-7373 or email admin@fhvnp.org. For more info, visit www.fhvnp.org. 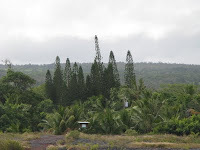 Saturday, September 17, 2011 from 8:30 a.m. to 2:30 p.m.
ON THE EDGE OF KILAUEA CALDERA. Join volcanologist Ken Hon for a 3 to 4 mile hike around and into Kilauea Caldera. Come find out how the current caldera formed and how it differs from the new vent that is currently active in Halema‘uma‘u Crater. Visit Sulphur Banks to see the outer ring fracture system of the caldera. Hike through a faulted valley and across the road to Steam Vents and Steaming Bluffs to learn about their relationship to the caldera. We’ll also pass the old Crater Rim Drive that partially fell into the caldera during the 1975 magnitude 7.2 earthquake. After the hike, the group moves to Volcano’s famed Kilauea Lodge and Restaurant for a delicious lunch of soup, Big Island fresh catch, wine, coffee or tea, and dessert. (Vegetarians can be accommodated with advance request.) Wine will be provided compliments of the Volcano Winery. Cost per person is $60 for members and $85 for non-members. Students (K-12 and college with valid student ID) are half-price. Non-members are welcome to join the Friends to get the member discount. Park entrance fees apply. To register, call (808) 985-7373 or visit www.fhvnp.org. Saturday, September 24, 2011 from 8:30 a.m. to 1:00 p.m.
VOLUNTEER FOREST RESTORATION PROJECT. Volunteers are needed to help remove weeds in Hawai‘i Volcanoes National Park for National Public Lands Day. We will work in the Devastation Trail area removing invasive, non-native knotweed (Polygonum capitatum). This is a low-growing plant and most work will be done kneeling or crouching. The soil is cindery and the knotweed should pull easily, although some have very long roots. We'll also learn about the park’s native forest restoration program and control of invasive plants. Volunteers should be at least 12 years old (younger children are welcome if accompanied by a parent), and be able to hike at least one mile over uneven terrain. Our goal is a crew of 25 people, and pre-registration is required. To register, call (808) 985-7373 or email forest@fhvnp.org. For more info, visit www.fhvnp.org. Hawai'iana Live at the Palace in Hilo - August 31, 2011 @ 11a.m. When: August 31, 2011, 11a.m. 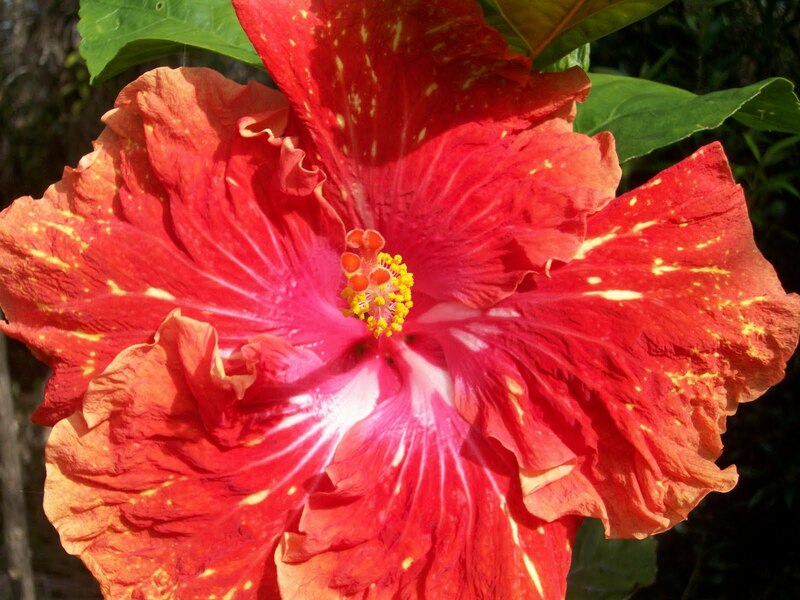 Hawai`iana Live! : E Lili`u E: Rick Mazeraski opens the show with the resounding strains of the Palace Theater's vintage pipe organ. Quack Moor shares a bit of the history of Hilo's historic Palace Theater before introducing the Palace Theater’s Hosts of Hawai`iana, Leilehua Yuen and Manu Josiah who share chants and songs of Lili`uokalani, last monarch of the Hawaiian Islands. Born on 2 September 1838, her life crossed into a new century as she watched continuous change wash over her island nation. Her joy and her comfort were found in music, which she graciously shared. She passed away on 11 November, 1917. Hawai`iana Live! presents a different facet of Hawaiian history and culture each Wednesday at 11:00 am in the Palace Theater, 38 Haili St. Hilo. $5 general admission. keiki under 12 free. For more information, on the theater and the show, call 934-7010. The Mauna Kea Visitor Information Station’s free monthly program, “Malalo o ka Po Lani,” will be held on Saturday, August 20th, 2011 at the Onizuka Center for International Astronomy Visitor Information Station’s presentation room, beginning at 6:00pm. The presentation will take place for approximately one hour, with our stargazing program following shortly thereafter. Join special guest Terri Napeahi and hosts Leilehua Yuen and Manu Josiah In “Sailing by the Stars,” as we explore how the Hawaiian night sky served as a navigational chart for our ancestors. Then, examine the interrelationship between, culture, art, and science. Terri Napeahi is the owner of Papa Mū, a fine art gallery featuring the work of Kanaka Maoli artists. Come up for Culture Night on Maunakea for an evening of Hawaiian music, chants, stories, and science as we learn about the Hawaiian Moon Calendar and the Hawaiian constellations of summer. Then, see them for yourself at the star party on the Onizuka Center lanai! Each month, a different Cultural Practitioner shares perspectives on an aspect of Hawaiian culture, history, and or arts relating to the natural history of Maunakea. The “Malalo o ka Po Lani” cultural program is held on the third Saturday of every month in the Ellison Onizuka Center for International Astronomy Visitor Information Station’s presentation room at the 9,300 ft eleveation on Mauna Kea. For more information on programs at the Mauna Kea Visitor Information Station please visit our web site: www.ifa.hawaii.edu/info/vis or call us at (808) 961-2180. On August 3, just after 2 p.m., the floor of Pu'u 'O;o collapsed and lava began erupting from new vents on the west flank of Pu'u 'O'o cone, sending flows towards the north and south of the cone. Since that time, lava has continued to erupt from these west-flank vents, but the active lava has retreated closer to the vent area and is largely contained within a perched lava pond. A very small amount of lava has returned to the collapsed floor of Pu'u 'O'o over the past week. Since the new Pu'u 'O'o vents opened on August 3, thelava lake within the Halema'uma'u Overlook vent has dropped substantially over the past week as the summit deflated. As of Thursday, the Halema'uma'u lava lake was small, sluggish and deep within the vent cavity. visit the HVO website for detailed Kilauea and Mauna Loa activity updates, recent volcano photos, recent earhtquakes and more; call 967-8862 for a Kilauea summary; e-mail questions to askHVO@usgs.gov. Fall Special: Receive a 10% discount on your entire booking on reservations between September 1 - November 15, 2011. When you make your reservation, please, mention “Fall Special 2011”. 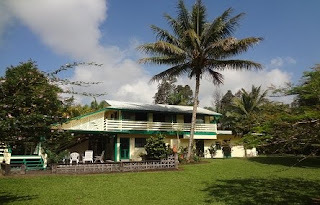 Hale Moana Hawaii Bed & Breakfast is conveniently located between Hilo and the Volcanoes National Park in the Puna area, close to Pahoa. Hale Moana Bed & Breakfast offers comfortable, spacious suites surrounded by 2 acres of beautiful tropical serene gardens. 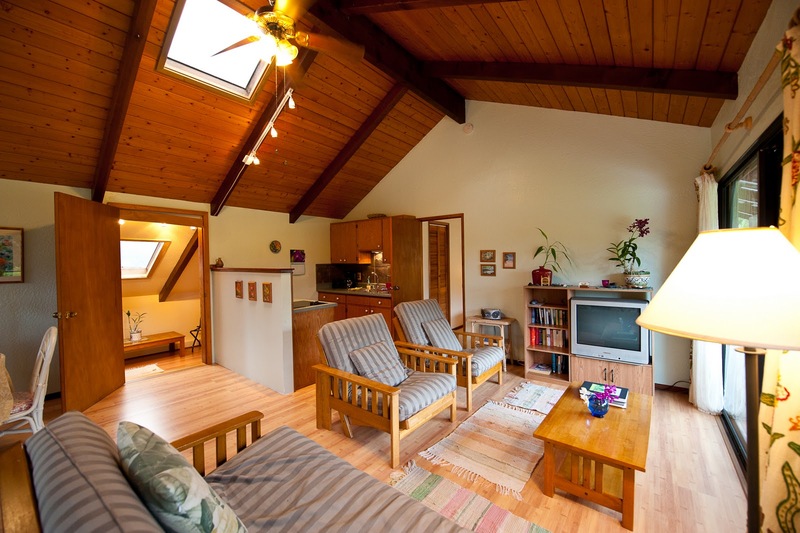 Two suites with living room and kitchenette, one studio, all with private bathrooms and separate entrances. 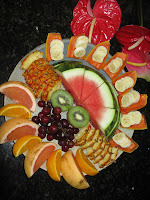 Our great Gourmet Island Breakfast is included in our rates. Families are welcome and there is no extra charge for children under 12. 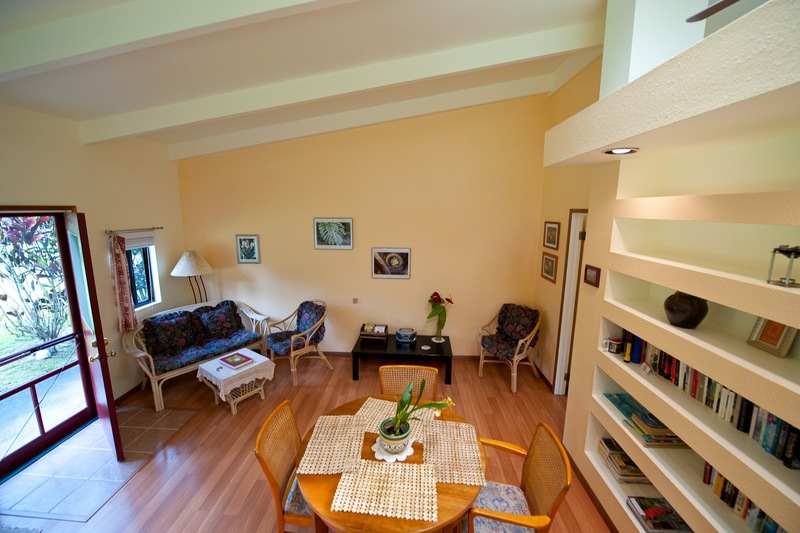 Free WiFi, free laundry facilities and many other amenities such as maps, snorkels, flashlight, etc. are also available to our guests. Hale Moana Bed & Breakfast's location is perfect to explore the beautiful Puna coast with its thermally heated pools (Ahalanui Park), excellent snorkeling (Kapoho Tide Pools) and black sand beaches or to venture to the Volcanoes National Park, Hilo and the area north of Hilo with its waterfalls and botanical gardens. 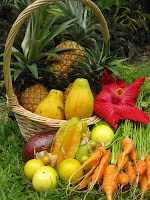 Pahoa is only minutes away with excellent restaurants, open Farmers Markets and an alternative flair. 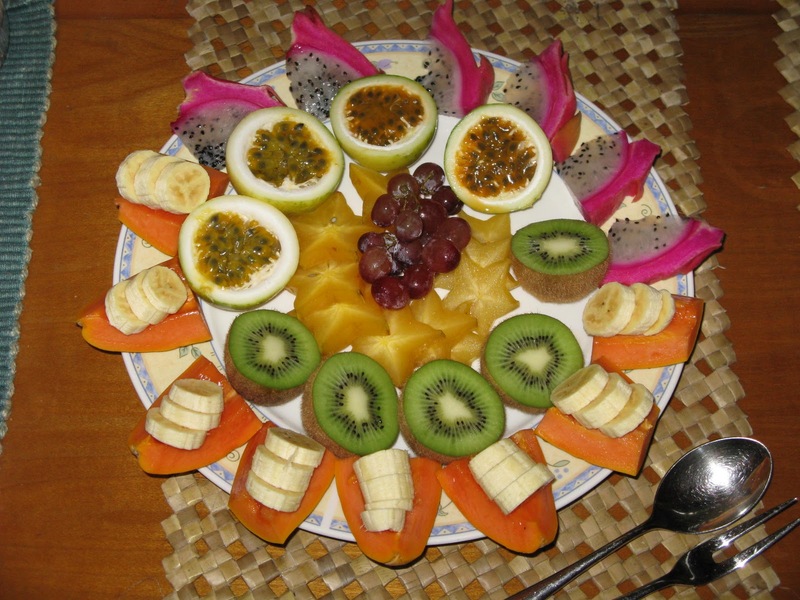 We would love to welcome you at Hale Moana Bed & Breakfast for the first time or back for another visit. Dramatic activity is happening at Kilauea, as a massive lava pond has overflowed its banks. On Wednesday, just minutes after the Pu'u 'O'o Crater floor started deflating, lava broke out, at the base of the west flank of the cone. It happened about 2:20 p.m., today, and within an hour, the crater floor and lava lake collapsed. Now there are two new flows, advancing down slope quickly. The events weren't entirely unexpected, however, since scientists have been keeping an eye on the crater for quite some time. Janet Babb, a scientist at Hawaii Volcanoes National Park says that over the past month, the crater floor has risen quickly. "We felt that that was leading to some kind of change. 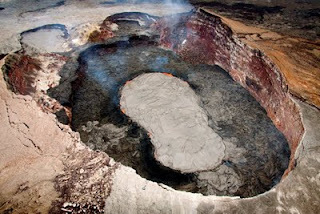 As the crater floor collapsed, so did the lava lake that was within Puu Oo crater. 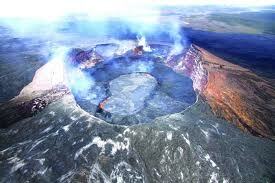 The lava lake that was within the PuuOo crater is no longer there." A photo of Pu'u 'O'o taken on July 21 (pictured, right) compared with another snapped on June 23 (pictured, below) illustrates the recent filling the Puka Nui and MLK pit floors on the west end of Pu'u 'O'o. The shoe-print-shaped object surrounded by lava is the perched lake. Lava drained from Pu'u 'O'o on March 5, when the crater’s floor deflated and collapsed during the Kamoamoa fissure eruption. On March 26, shortly after the eruption paused, lava abruptly returned to the crater’s floor. As scientists tracked the refilling, they noted the development of the perched lava lake, which has resembled an above-ground swimming pool. In early June, the perched lake’s levee climbed to a height of about 33 feet above the crater floor. At that time, the floor was about 170 feet below the crater rim. Subsequent lava lake overflows have pushed the full crater floor closer to the rim. Last week, the observatory released a time-lapse video illustrating the uplift of the lava lake and crater floor in Puu Oo, spanning July 9 to July 18. During the filming, frequent small spattering of lava flowed over the rim. Also, a small collapse of the steep levee wall resulted in a short-lived breach of lava out of the lake on July 15, according to an observatory report. Scientists maintain that the uplift of the perched lava lake is is probably due to a shallow injection of magma beneath the crater floor. Daily updates on Kilauea volcano activity are available at the Hawaiian Volcano Observatory website. Hawai‘i Volcanoes National Park has closed the Chain of Craters Road until further notice, but sections of Crater Rim Drive remain open. For more information about access and road closures, Park visitors should call 808-985-6011 or email havo_interpretation@nps.gov. The lava lake within the Halema'uma'u Overlook vent remains at the relatively high level within the vent cavity as the summit of Kilauea continues to inflate slowly. Heating of the vent walls above the lava lake continues to cause loud popping and cracking noises - sometimes audible from the Jaggar Museum Overlook - and glow from the summit has been bright. 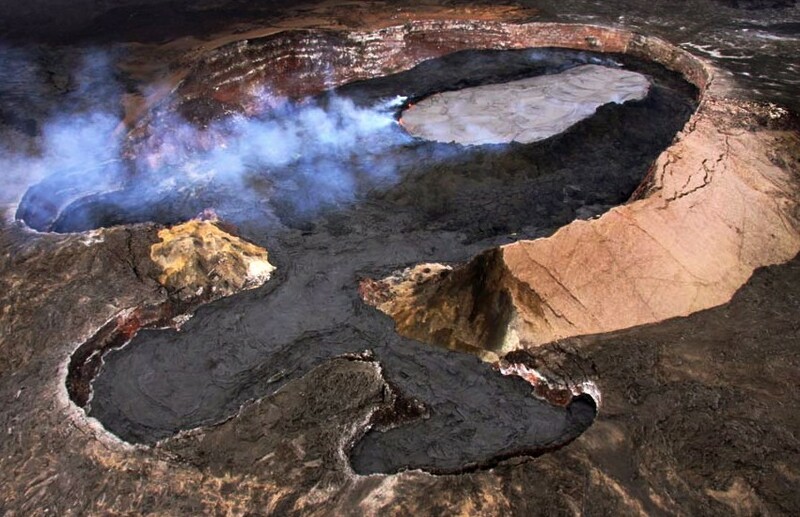 The perched lava lake within Pu'u 'O'o crater remains active and has continued to be uplifted by underlying magmatic pressure over the past week. On Monday, July 25, lava erupting around the base of the lava lake overtopped the low western rim of the Pu'u 'O'o crater and began flowing outside the crater towards the southwest. This relatively narrow flow, entirely within the National Park and flowing towards the western margin of the existing flow field, has continued to be active at the time of writing. No earthquakes beneath Hawaii Island were reported felt this past week. Visit the HVO website (http://hvo.wr.usgs.gov) for detailed Kilauea and Mauna Loa activity updates, recent volcano photos, recent earthquakes, and more; call 808-967-8862 for Kilauea summary; e-mail questions to askHVO@usgs.gov.